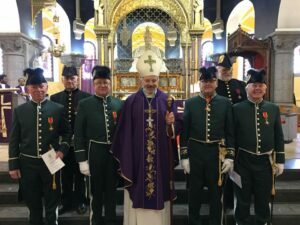 Brother Barry MacMahon, Last Past Supreme Knight of the Knights of St. Columbanus was invested as a Knight of the Pontifical Equestrian Order of St. Gregory the Great in the Cathedral of the Immaculate Conception by Most Rev. Kevin Doran, Bishop of Elphin. The Order of St. Gregory the Great is one of the five Orders of Knighthood of the Holy See. The honor is bestowed upon Roman Catholic men and women (and sometimes in rare cases to non-Catholics) in recognition of their personal service to the Holy See and to the Roman Catholic Church, through their unusual labors, their support of the Holy See, and their excellent examples set forth in their communities and their countries.